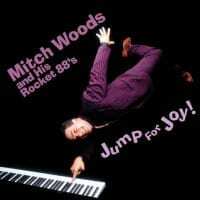 A piano player of unmatched excellence, Mitch Woods has been pumping out his infectious brand of "rock-a-boogie" for over 20 years. Though his music is inspired by the humor, style, musicianship, and showmanship of the likes of Louis Jordan, Cab Calloway, and Louis Prima, Mitch is quick to distance himself from the nostalgia seekers who only wish to mimic these legends of the past. 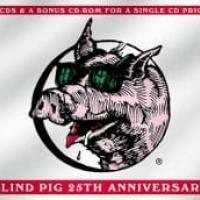 Mitch demonstrates his mastery of the idiom by writing all the tunes on his fifth Blind Pig release, and delivering the music with a freshness and vitality that is exhilarating. This spirited collection of jump blues, boogie-woogie, and New Orleans R&B raises the roof with its rollicking high energy and toe-tapping grooves. Brimming with good times, Jump For Joy is irresistible, original music that is thoroughly modern, yet timeless. This is swing revival, boogie-woogie, jump, big band, and the blues all rolled into one satisfying serving. This album, Jump for Joy, recorded by Mitch Woods & His Rocket 88's, is hip-rolling, feet-moving joy for the ears. In fact, the title is a name the artist felt fit the style of music he was offering here, and fans have agreed with him. Longtime singer/songwriter and pianist Mitch Woods brought not only his band, the Rocket 88's, in on this recording, but also a number of other musicians, including saxophonists Danny Bittker, Michael Peloquin, and Jeff Ervin, trumpeters Tim Hyland and Mike Whitwell, and trombonist Mike Rinta. They actually finished this album three years before it was finally released to the public. This album is probably one of the best works Woods has put together in a while, if not the best altogether. Some of the good-time groove numbers you can sample on this album are "Swingin' at the Savoy," "Jive Mr. Boogie," "Golden Gate Jump," "Easy Street," and "Straight Eight."